Limerick’s St Munchins College have been announced as a national winner of the Friend’s of the Earth Solar Schools Competition. The school were officially named as winner of competition at a ceremony held in the school on Monday, 21stJanuary. The Solar Schools competition recognises schools who engage in activities focussed on renewable energy and promoting climate change in their communities. St Munchins College in Limerick, as one of only 5 winning schools in Ireland will now receive solar panels, designed and installed at their school in 2019. The panels, worth €10,000, will enable the school to power themselves with free renewable electricity generated right from their roof. Limerick entries to the Friends of the Earth Solar Schools Competition were led by Tait House Community Enterprise which is currently in the process of developing a Community Power initiative. Speaking at the awards presentation, Ms. Sara McGreer, Green School’s Co-ordinator and the teacher responsible for co-ordinating the St Munchins College entry, said: “Over the past 5 years the school, driven by our Green Schools committee, have been working hard to make St Munchin’s College a green school. Over that time we have achieved flags for waste, energy and water”, she said. “This award is testament to the hard work that has been done by our team of teachers, students and committee members. Not only will our new solar panels allow us to make a real impact in terms of the generation of renewable energy in our school, it will also allow us to educate our students on sustainable energy in a practical and hands on way”. The St Munchins College entry to the Solar Schools Competition was focussed on what was identified as an overreliance on the use of cars as a primary means of travelling to and from the school on a daily basis. A survey conducted showed that 62% of students in the college live close enough to either walk or cycle to school. Sara McGreer says that the survey also identified that the school was not providing enough bike racks for students. “Our entry showed creativity through the idea of using recycled tyres to create new bike racks. We also developed the idea of organising a day for where all students were required to walk, cycle or car pool”, she said. We plan to work closely with Limerick City and County Council in terms of safety issues but ultimately we want an outcome where we raise awareness around the issue of the daily commute. Our entry has allowed us to highlight the fact that our daily commuting habits are not only easy to change but can have a profound impact on our school’s environmental impact. Tracey Lynch, CEO of Tait House Community Enterprise says the St Munchins College entry to the Friends of the Earth Solar Schools demonstrated a real commitment to and understanding of promoting sustainable energy solutions among our younger population. “I want to congratulate Sara McGreer and all the teachers and staff at St Munchin’s College for all their hard work and look forward to witnessing the very tangible results the school will see from their new solar panels. I must also give great credit to Bill Kelly who has been driving the Community Power initiative here at Tait House for some time. Bill and his team helped to co-ordinate the Solar Schools competition entries”, Lynch said. 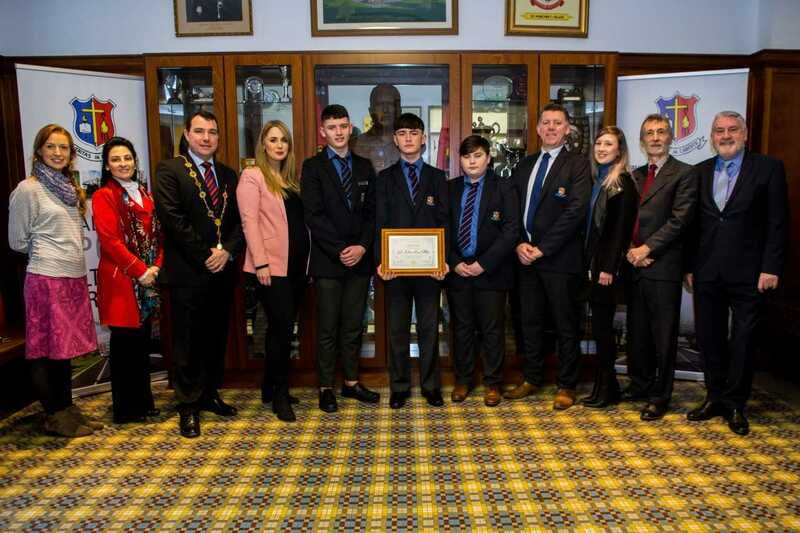 “We were delighted to see so many entries from schools in the Limerick region and the fact that a Limerick school has been named as a national winner gives us the impetus to continue driving our sustainable energy message over the coming years. Competitions like the Solar Schools competition are a perfect tie-in with the Inspire Social Enterprise Schools Programme we are running through Tait House. Through this programme we hope to educate our young school going population in social entrepreneurship and how to develop new ideas that can make a real impact on their communities”. Speaking at today’s award presentation Kate Ruddock, Deputy Director of Friends of the Earth said: “We were extremely impressed by all the entries we received from schools in Limerick during the initial stages of the Solar Schools competition. After evaluating all the entries our judging panel identified the St Munchins College entry in Limerick as one of the stand-out entries. This result was backed up by the fact that the school also received the top number of votes in the public vote, garnering 37% of the public vote”, she said. St Munchins College will receive their new solar panels over the coming months and will also have the opportunity of working with Friends of the Earth to begin the process of implementing their award entry ideas. 0 responses on "St. Munchin's wins Solar Panels Competition"